UNITY * HUMANITY * UNIVERSALITY k'taogm-m #3 THE WISE MAN SEEKS THE TRUTH TUMBRILLIANTINE MIRROS FROM M'LO NEGOTIUM PERAMBULANS IN LUCIS MORE TUMBRILLIANTINE THE NIMBLE SNORTS TRANSCRIPTIONS FROM THE TERRESTRIAL INDIVIDUAL TALENTS AND THE DEVELOPMENT OF ART K'taogm-m: a Little magazine, published and edited by Donald A. Wollheim for the Vanguard Amateur Press Association. 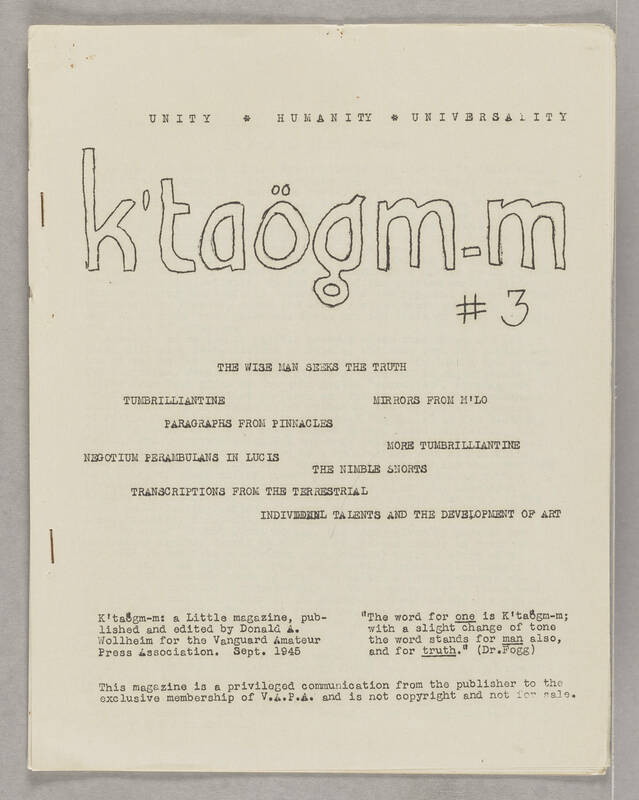 Sept. 1945 "The word for one is K'taogm-m; with a slight change of tone the word stands for man also, and for truth." (Dr.Fogg) This magazine is a privileged communication from the publisher to the exclusive membership of V.A.P.A. and is not copyright and not for sale.